Shooting Review: M&P 45 Shield | Eagle Gun Range Inc. The M&P 45 Shield is Smith & Wesson’s new compact, single-stack pistol chambered in .45 ACP. The 45 Shield is virtually identical to the original Shield in 9mm and .40, with the same design and look and is only slightly larger. I have never been a big fan of the M&P Shield, but I’m in the minority. The Shield is one of the most popular pistols and just might be the most popular single-stack pistol for concealed carry, ever. Bringing that popular and proven design to the single-stack .45 class, Smith & Wesson are sure to disrupt, maybe even dominate that category. I’ve spent a few days shooting the new M&P 45 Shield, including a bit of side-by-side comparison shooting. What follows are my impressions from that experience as well as some technical comparison with popular competitor models. Why Consider the M&P 45 Shield? The 45 Shield belongs to a specific category of carry pistols and is not meant to compete with or replace double stacks or pocket pistols. Rather, as a single-stack, slim compact, the 45 Shield is purpose made for when you want to carry a highly concealable .45 that you can hold onto while firing in defense. The slim frame and slide conceal easily and the grip, even with the flush magazine, is substantial enough to give you good purchase while firing .45 ACP slugs. Some people believe that 6-8 rounds of .45 ACP is better than 7-9 rounds of 9mm. I’m not among them, but if you are I think you should strongly consider the 45 Shield. Note that the 45 Shield come with or without an external thumb safety. The model I’m evaluating here had a thumb safety (which I completely ignored, as it is a dangerous liability). The 230 grain .45 ACP round packs a punch, so when shooting it from a small, thin, and light frame there’s no getting around the fact that it is going to be a bit snappy. Having said that, I found the 45 Shield to be far more comfortable to shoot than I expected. In fact I found it a bit less jarring than shooting my 9mm Glock 43, as even with the bigger kick there is more to hold onto with the 45 Shield. Also, the grip texture was a boon to comfort and controllability. I found the trigger action to be quite good and the pull weight to be pretty standard. Nothing to write home about or complain about here. For the purpose of this review I shot a few hundred rounds, but all of it was 230 gr. ball ammo. I therefore cannot comment on how it handles defensive rounds. Half was Winchester brown box and half was 230 gr. Armscor. The Armscor was quite a bit hotter than the Winchester, which was revealing when I shot this ammo in the side-by-side comparison with the Springfield XDS (more on that later). The 45 Shield ran just fine and experienced no malfunctions or hiccups. 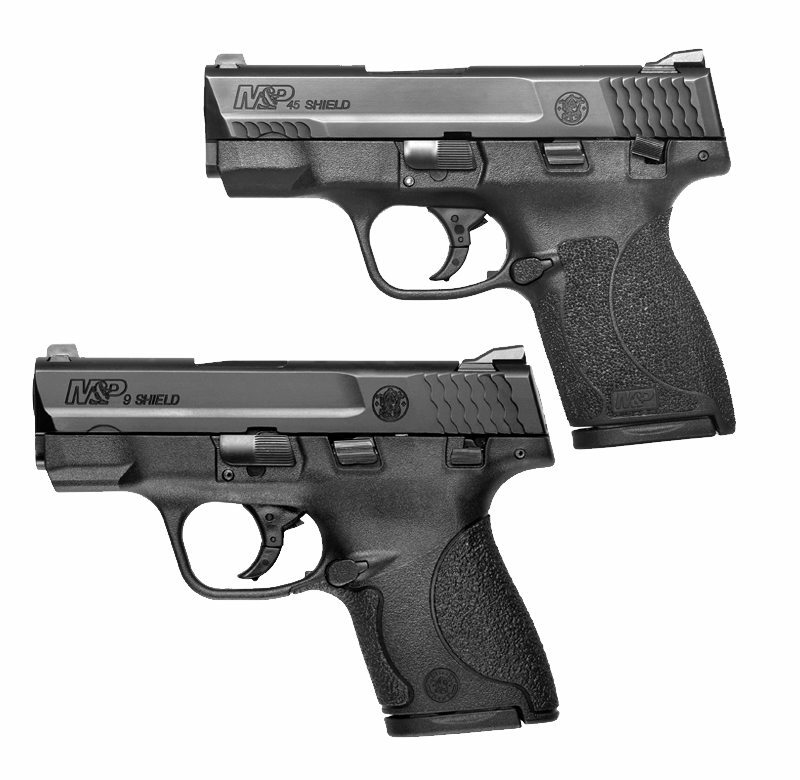 The M&P 45 Shield comes with two magazines: a flush magazine that holds 6 rounds and an extended 7-round magazine. The extended magazine makes a good backup, but it makes the grip too long for advisable concealed carry. The six rounds in the flush mag and one in the chamber is pretty good for a single-stack .45 compact. As mentioned before, the grip texture is quite good. 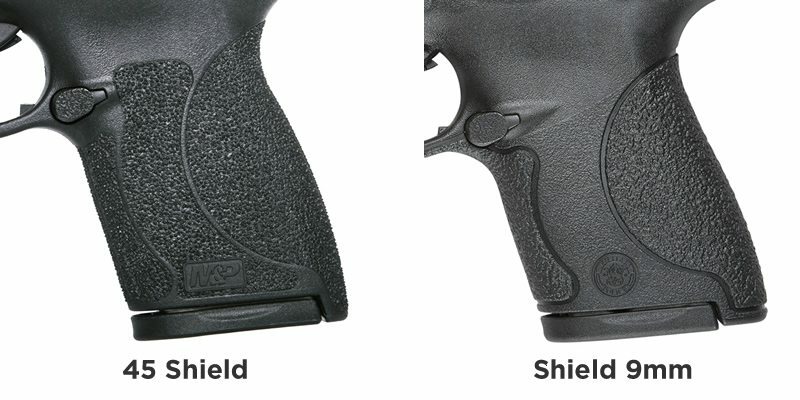 It is more aggressive and covers more surface area than standards M&P Shield grip texture. It makes it quite easy to maintain a good grip when firing strings of several rounds. Missing, however, is the same texturing on the forward thumb position of the frame. 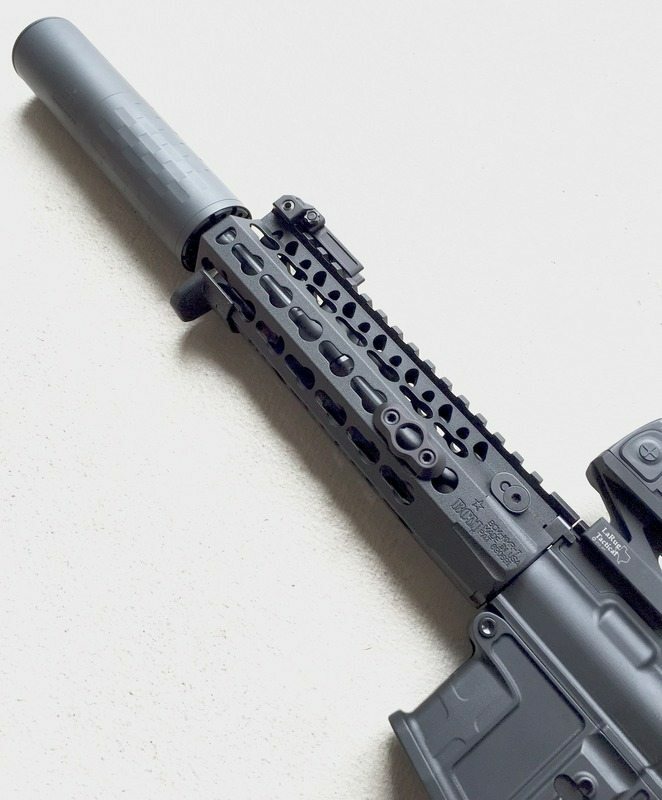 This position where the support-hand thumb rests is an important component to recoil management and the slick polymer here does the shooter no favors (*cough* Can you hear me now, Smith & Wesson? *cough*). I have never been a big fan of the M&P Shield (9mm) in part because the grip always felt a bit too thin for my taste. This 45 Shield frame is only slightly larger and thicker than the standard model, but it is far more comfortable for my hands and seems to handle the .45 round pretty well. In fact I was comfortable shooting 100+ rounds with it in short order during each shooting evaluation session. 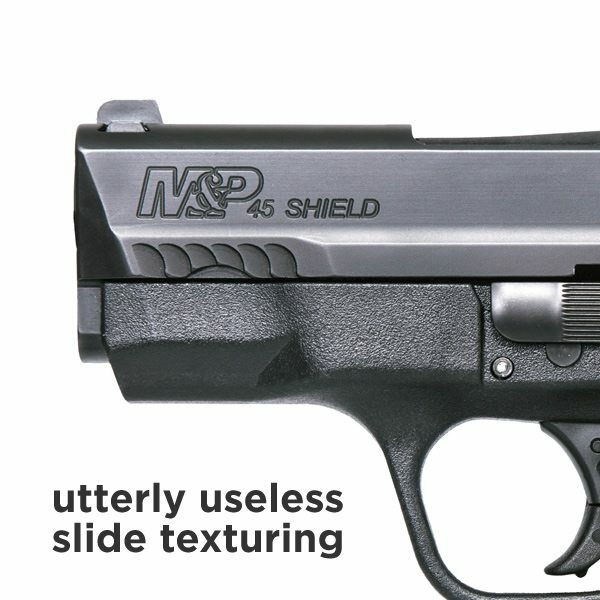 The model I used for evaluation came with the external thumb safety, but the M&P website indicates it is available without an external safety. I found the slide lock to be easy to manipulate when I wanted to lock the action open, but it did not get in my way when shooting and it is well positioned for my medium-sized hands (I didn’t accidentally ride it, preventing the slide locking open on the last round of a magazine, as happens with some small pistols). The takedown lever is quite unobtrusive. It is smooth, rounded, and very low-profile on the frame. Well done. Like the other Shield models, the 45 Shield has the hinged trigger and trigger stop on the bottom of the trigger well. I thought the trigger reset was only a bit too long for my taste. The magazine release, as with all Shield models, is not great, but not terrible either. Also like the other M&P Shield models, the 45 has white 3-dot sights that seem to work just fine for my eyes. You may want to replace them with night sights. I spent 100 rounds shooting the 45 Shield side-by-side and back-and-forth with the Springfield XDS 45 3.3”. I found the M&P 45 Shield to be more comfortable and slightly more manageable in the firing strings. After 70 rounds or so I had begun to unconsciously compensate for the XDS’ recoil, resulting in hits a bit lower than my intended point of aim. I had no such issue shooting the 45 Shield, perhaps because I was able to get slightly more of my pinky on the grip. I found the 45 Shield to be quite accurate in my hands; shooting 5-round strings in 4 seconds, freehand, with <4” groups at 15 yards. For my money, that’ll suffice for defensive-engagement utility. The 45 Shield is an eminently shootable and concealable, big-bore single stack. The external controls are well designed and unobtrusive and the capacity is as good as one might hope, given the small size. If you like the M&P Shield (and a great many people do) and enjoy .45 ACP, you should warm to the 45 Shield. Shooters will enjoy the grip texture and controllability of this small pistol. Other than the lack of texturing on the forward frame, and given the purpose and category of pistol we’re talking about here, I can think of nothing substantive to criticize on the 45 Shield. It has a small capacity, but then it is very concealable. It does not hide the thump of the .45 ACP round, but it is less snappy than at least some competitors and, again, it has a small and concealable frame. As for nitpicks, I’ll point out that the small area of serrations on the bottom of the front of the slide are completely useless, and unattractive to boot. I think the 45 Shield feels good in the hand, and far better than the 9mm model. The controls are well placed and unobtrusive. The rear slide serrations are excellent. This is an eminently shootable pistol, though a bit more violent in the hand than, say, a 9mm compact. The grip texture does a good job here. I found it to be plenty accurate, but the 3.3” barrel is not best suited to great distances. For defensive use, no complaints here. The 45 Shield has a thin frame that is only .04” wider and only .28” taller than the Shield 9mm. As such, this is a big-bore pistol that can go anywhere with you in any season. This is a solid and well conceived example of a thin-framed compact in .45 ACP. 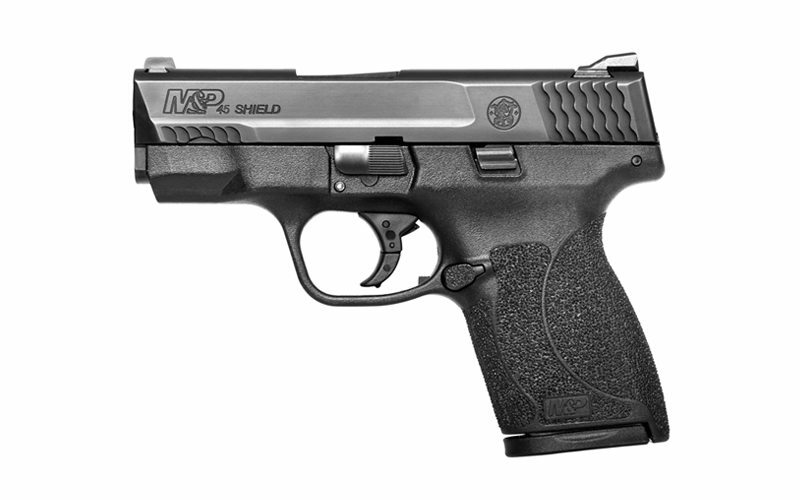 The M&P Shield is a proven performer and popular success. I have to believe that this big-bore version will do quite well. So long as time bears out its reliability, I think this is the pistol to beat in this particular class. Also, I would tend to trust the quality of Smith & Wesson’s M&P line. I don’t believe that a thin-framed single-stack is the best way to carry .45 ACP rounds. But for those of you who like the idea of a thin, compact .45 in your belt—especially at only $30 above the Shield 9mm price—this one might be unbeatable. As a Springfield fan, I sought out to shot the XDS in .45 over the weekend to find a carry pistol in that caliber, and frankly I was less than impressed. Obviously I will need to try out the Shield next due to this article, thanks. Yes, I’d recommend the Shield if you want to go with a compact single stack. I would advise against so small a gun for .45 though and recommend the Glock 30s as a better alternative. It, too, is compact, but as a double stack pistol there is more to hang onto. Quite easy to shoot. 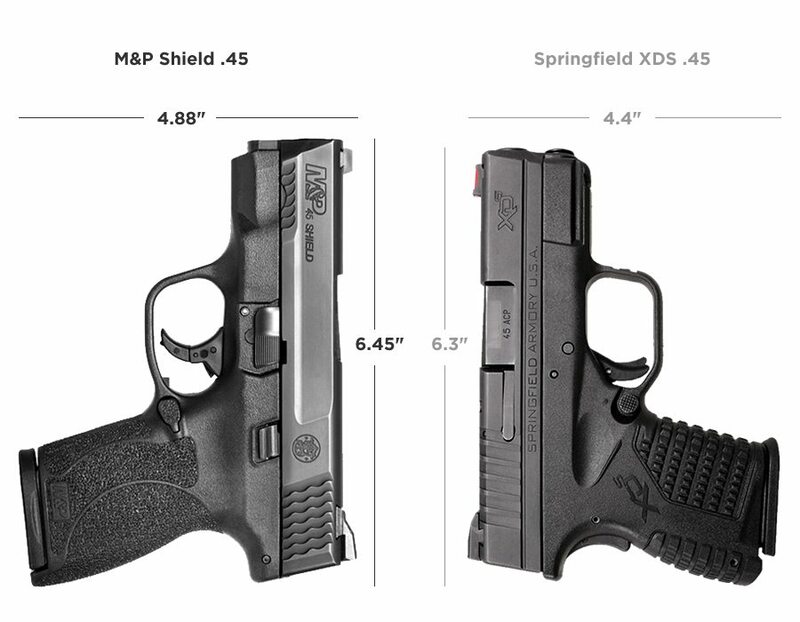 But I do like the 45 Shield as compared to the XDS. Cheers! I owned the XDs 45. Great pistol. Could hit a small piece of metal at 100 feet with it. I sold it. Missed it, so I have a Shield 45 coming. I had the Smith and Wesson M&P 357 with the 40 caliber barrel included. One of the most accurate pistols I have owned, and I own some of the best; H&Ks, Walthers, CZs, Remingtons, Colts, Dan Wessons. I got rid of my Sigs after they dis-honored their rebate rewards program. You are 100% correct. If you need more than the 45 shield you do not need more rounds you need more distance between you and the problem ! Andy, I bought a Glock 19 a few months ago and haven’t fired it! I’m thinking about getting a 45 shield but I’m wondering if I need to wait till I can afford a Glock , what’s your opinion buddy? Thanks! My opinion is that if you need a subcompact .45 for daily carry, the 45 Shield is likely your best option. However, the Glock 19 is perhaps the best gun ever made, for all purpose duty, carry, competition. If you’re a shooter, shoot what you have. If you’re a collector, I’m not sure I should influence you. :) Cheers. I too, already owned the 9. Wish I had bought the 45. Now I did. Even at $360 glad I got it. Best gun ever!!!! Just bought mine yesterday. Fired 50 round that day. Handles well feels great in the hand has less kick than my s&w sd9ve and shoots more accurately. All in all i love the gun so far. Cant wait to shoot more rounds through it. This will be my concealed carry firearm and for the price its great. Even got a 75 dollar rebate from s& w website. My wife also shot the gun and she handled it well. I would recommend this gun. Just bought a S&W M&P shield in .45 . It is far an away the best carry and conceal weapon I’ve owned. They don’t make a bad gun period! This one in this class is the one to beat!!! Pistol. S&W and Ruger make great and reliable guns. Hey guys, I too just bought a Shield 45. But I’m havin a little difficulty in locating a “pancake” for it, or a IWB. Any recommendations? Go to Crossbreed’s web site, they have what you need. Try Shape Shift. It gives you options. I own an M&P Shield in .40S&W. I test fired the .45 at a local gun store. I also asked to trade on the spot. I lile my .40 but that .45 was nice. Felt good in my hands with good controlability. It’s my next purchase! I recently purchased a S&W Shield 45 from eagle and it is now my preferred carry weapon. I will gladly trade my 13 round 9mm Taurus which is still a great gun, for the power and accuracy of the 7 round S&W Shield 45. I trained with a Colt 1911 in the service and have not found a carry weapon of it’s quality until now. This will be difficult for even Glock to match. 3 to 4 inch groups at 7 to 10 yards are fairly easy with the lack of recoil of this well controllable weapon. I have the no safety version, and I must say after years of trying to find the perfect IWB carry gun for me the Shield 45 is it. I’ve owned my shield 40 for a few years and love it. I’ve had the glock 30s and to me its like most glocks I’ve held like a block in the hand. Even got a 27 and still didn’t feel right. Picked up the shield and it was game over. Once in hand I had my mind made up instantly. Feels nice, slim and light. Love the 40 round. If the 45 is as nice to hold and shoot as the slimmer 40 shield I’ll be sold instantly. Was looking at subcompact 9mm. I have been here before, and was never happy with the trigger on any I tested. Was probablyLC9s after trying great trigger. Then I picked up the Shield 45 and it was game over. I could get all 4 fingers on it, and the grip felt great. I have some arthritis, but my fingers and thumb gave no complain, even after a perfect out of the box 100rd test fire session. No sting, no chafing from aggressive grip. I wanted the .45 acp Shield for worse case no-high-tech-ammo-available use. I think Smith&W got the trigger just right on the Shield 45. It breaks kinda far back, requiring a longer deliberate trigger stroke, and trigger pull light enough not to shift impact, but requires just enough pressure to need deliberate pull , with a decent break. An impressive balancing act I have no desire to alter with aftermarket parts. Only minor complaint is need to wear a t-shirt undergarment for IWB or AIWB carry. That grip sandpapered my right love handle without the t-shirt. From pistol to holster to bullets to night sights, I am proud to say I bought it all Made in America. Try the N82 holster. Very comfortable next to bare skin. I have had a Glock 30 then a 30 “S” for 20 years. I got rid of it and bought the performance Center 45 Shield. It is so much easier to carry. Eight rounds is the same as a 1911, and with 2 spare mags, really, who needs more? If you are in that much trouble, you are going to take heavy fire, and should be looking to cover your escape, rather than add more mags. I, too, have purchased the .45acp in this pistol. I also carry a Glock 26 with +2 mag extension and a Glock 23. The drop in round counts when going to the Smith is something to consider but not earth moving! It just makes getting that first shot placement all the more critical. As to the firearm, is is the same size as my Glock 23 however a little thinner, being a single stack v.s. a double stack. I wanted something in a “big bore” to carry, hence my purchase of this firearm. I also agree that the rough texturing should expand into the thumb placement region on the frame. Enter Talon Grips and a custom cut piece of grip tape on both sides. Love this little pistol! I went to cabelas to purchase a 9mm. The guy at the counter handed me a shield 45 (as an example gun) to compare—he just picked it at random. As soon as I put it in my hand, I could not put it down. WOW. Talk about perfectly balanced. I gave it back and kept looking at 9’s, but I kept asking “can I see that 45 shield again”? After the 3rd/4th time I went back to it I said eff it and got one. Never would have thought I’d get it but it fits me, my hand, my persona perfectly. AMEN BROTHER!!!! I have had shield 9 and .40……they are now gone. I LOVE my Shield .45!!!! the 45 SW Shield comes with 2 mags and can hold how many ? I never notice recoil in a live fire exercise as I don’t feel recoil from a shotgun when duck hunting. Way too much emphasis is put on recoil. I can assure you if you are in a scenario where the bad guy points a loaded gun at you, you won’t feel the kick of a handgun. I currently carry a Glock 23 and the snap of the .40 is a non issue. I just purchased an M&P 45 Shield and I’m looking forward to a little smaller CCW platform but with similar knock down power to a .40 Caliber ——- yes there is such a thing as knock down Power. I purchased all three caliber Shields. The .45 was the last purchase since it was released last. It’s a fine shooter. The first time I CCW it with no under shirt in my vehicle, I couldn’t wait to get it away from my love handle. I lightly sanded the handle with fine sandpaper and now it’s perfect. I still have a good purchase on the gun and there is no visible sign of sanding the sharp points. I daily carry with the 7 round mag and have no problem concealing the pistol. I carry it in a Vedder IWB Light Tuck holster all day in comfort during the summer heat inTexas with just a t-shirt. It’s a great gun that has handled every brand and type of ammo I fed it. Great, thorough, and accurate review of this pistol. Thanks for taking the time to do this and publish it. I’ll bookmark your website. Purchased my .45 Shield 6 weeks ago- with night sights, no safety- and have shot over 500 rounds with only one problem. Installed an APEX “Thin Blue Line” trigger assembly @ about 200 rounds and I also carry in a Vedder IWB Light Tuck. While I’ve had no malfunctions; yesterday @ the range, I noticed that the illuminated center portion of my front night sight has fallen out (leaving a peep sight hole behind). S&W service center is not open on weekends so I’ll wait until next week to check out their customer service. Other than that, I’ve been impressed with how nice my Shield handles. I have been to a gazillion sites on firearms trying to gather info before making some decisions,and many are helpful. The one answer I have trouble finding is how much ft,lbs. of energy is needed for penetration in summer attire or winter, also for hunting purposes. The energy at certain ranges is available but not how much is NEEDED. Hope my question has been explained clearly…James. For ammunition performance, see Lucky Gunner – defensive handgun ammo tests. QUITE revealing. My carry ammo in 9, 40 & 45 is now Federal HST! There is no better. Ive carried, used, and competed for over 25 years. I’ve never understood the sentiment that a safety is a “dangerous liability. ” If your level of expertise and training are such that effectively manipulating a safety is a problem then you probably don’t need to handle a weapon. I have never had a safety fail. I have witnessed numerous negligent discharges from people operating weapons without a positive safety. Rebate..You couldnt purchase a better ,reliable firearm…..Unless you have a love affair with a second choice. It meets most majot needs..Highly recommend it. Thank’ s to all of you for the information. Thank you Smith & Wesson for giving us this type of pistol in 45ACP for concealed carry. The 45ACP is good old fashion American stopping power. There is no substitute without going to the magnums. My 1911 has never let me down in the real world , just to big to conceal in public. I’m looking forward to purchasing the Shield 45. God Bless the United States and all of you. OK. You can drop a grand on a quality 1911, and then worry about damaging the finish. Or, as I did, buy all 3 caliber SHIELDS and have a ball!! However, I do have an extremely strong fondness for the .45. It saved my life 5 times in combat. (total 6 rounds fired.) Maybe it really is silly to shoot twice, unless you pull the first shot in an adrenaline filled rage. Your opponent will take a permanent dirt nap if you hit center mass. Try all three in 1 session, if possible. Whatever version floats your boat is the one to carry. You can’t go wrong. Remember, train, train, train. That’s the fun part! I purchased the S&W M&P 45 Shield from a friend of mine who only ran maybe 100 rounds through it! I am a pretty small guy at 5 7 and a buck 20 and I Love this gun..It was really accurate and manageable with 230gr even for a guy my size and never shooting a 45 cal. before! Its my EDC and to be honest I won’t want or need another EDC for awhile! Trust me anybody who shoots the shield 45 will LOVE IT! !